Brand new 4 track EP from the legendary French producer who delivers yet more synth squelchy & elastic beats for the electro-house / glitchy dance set. 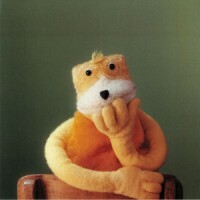 With Flat Eric in tow once again, Oizo playfully pulls and twists his synthesizers around a plethora of unique beat structures, littering the mix with a classy warbled rap on "Dolce Vita" featuring vocalist Phra. The main focus however is squeezing every last bit of originality out of the various knobs and sliders at his deposal - demonstrated perfectly on the constantly evolving electroid squelch of EP opener "Rhthme Plat". A producer who maintains his unique and approach no matter what genre or tempo he's working with; all four tracks reveal themselves to be undeniably Oizo thru and thru. Recommended!